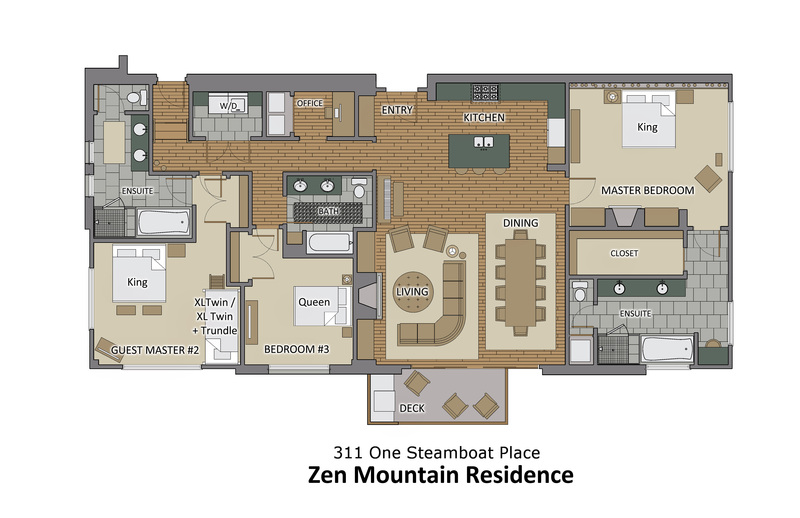 The slope side Private Residences at One Steamboat Place are located at the Gondola and offer ski-in/ski-out ease. This residence has been filled with custom touches from India and throughout the world. You will be taken away with the custom touches in furnishings and art throughout this beautiful home. The layout allows you to benefit from the extra space in the common areas since this residence is designed as a 3 bedroom. It can also be rented as a 1 or 3 bedroom option. There are three bedrooms in this grand residence; you choose any two, all with high end mattresses. The master bedroom will delight you with the birch tree wall, custom furniture, custom marble lotus flowers, petrified wood night stand and gas fireplace. The master bath features a steam shower and Jacuzzi tub with TV and separate make up area. The second bedroom also offers a King bed plus twin bunk beds and a twin trundle bed. From the room you can view the ski mountain or out of the other side to the flat-tops through giant windows. This bedroom has a slightly more industrial feel with the custom alder wood and walnut furniture. When you aren’t enjoying the views there is a flat screen tv and custom art work from Christy Freeman. The third bedroom offers a Queen bed with hand sewn tapestry and custom Colorado red stone end tables and dresser. The living room also has a Queen Sleeper-Sofa.